Our Children's program teaches discipline and respect, while also providing a nurturing atmosphere for learning. 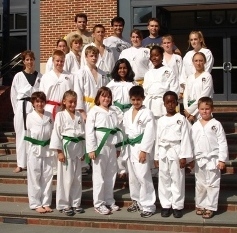 Martial arts is a great way for children to meet and make new friends outside of school. Students will practice self defense that is practical and efficient, learning from instructors who understand the deeper concepts driving each technique. By training in the classical method, each instructor holds a wealth of knowledge which translates into more diverse and productive sessions for the children. Safety is stressed, teaching that the mark of a martial artist is having awareness to avoid physical altercations when possible. Children will benefit from a high instructor to student ratio, often resulting in 1-on-1 attention. The lessons learned will translate to other areas, helping the children to become more focused and respectful. Visit us to find out what other benefits we can provide for you and your child. For ages 6+. Please email us for special prices regarding parent & child classes, children classes, and special offers. Note: Please email us for specific directions to classes.